It’s been a bitter February. The outreach teams have been out in force across Britain’s cities assisting rough sleepers to come inside. Bizarrely, even in -5 degrees some people remain implacable in their determination to stay in the shop doorway. According to some observers this is a ‘lifestyle choice’ though I tend to agree with @aibaihe, a particularly insightful tweeter who, after almost two constant years of rough sleeping, reflected recently: ‘I have never met anyone on the street who didn’t want to live inside’. Thankfully hundreds of rough sleepers did escape the streets during the cold patch as Severe Weather Emergency Protocols or SWEP were triggered and additional beds made available. Despite this monumental effort there exists a corrosive cynicism about the work undertaken with rough sleepers by outreach teams. They are sometimes called ‘government funded’ outreach teams, this being a pejorative term. I remember how, in the 1980s, we tirelessly campaigned to force government to take seriously the issue of rough sleeping by funding street outreach teams in the certain knowledge that the money was not going to come from shaking collection tins at railway stations. We were realists. Rough sleepers sometimes smell and occasionally do bad things. They do not have the premium brand of innocence carried by aged donkeys or baby seals. So I watch our street teams girding up for another street shift, already red-eyed and exhausted after too many late nights and mull over with considerable resentment the detail of yet another phone call from an intrepid journalist who, like the gaggle before him, wanted to discuss the rumour that we are trying to ‘clear the streets for the Olympics’. The same journalist inquiring about pernicious attempts to clear the streets moved effortlessly on to the other story, the increase in rough sleeping, the prevailing orthodoxy being that society no longer cares and we are returning with grim inevitability to the days of ‘cardboard city’ when vast numbers of people congregated together to sleep in parks and under bridges. But I cannot agree that things have got worse, indeed in many ways they have got immeasurably better and our responses more humane. In 1986 during one of the coldest Februarys for decades I remember leaving the Embankment in central London at 2.00am in the morning in the knowledge that around 80 men and women were that night consigned to sleeping fitfully on the pavement or in the two red telephone boxes nearby. There was no SWEP provision in those days. Twice during my four years as an outreach worker those boxes were opened in the morning by street cleaners for them to find the frozen body of a dead rough sleeper. Then it felt as if we grieved alone, with the death of a rough sleeper barely rippling the surface of local authority consciousness. Today the death of a person sleeping rough is treated with considerably greater seriousness, frequently subject to detailed investigation and is always a matter of remorse and regret. Recently released government figures on rough sleeping suggest that numbers are on the increase. Unfortunately the government has trapped itself into reporting on rough sleeping through a mechanism which mixes ‘snapshot’ street counts with local authority estimates, a flawed, inconsistent approach producing essentially inconsequential numbers. In London a shared database called CHAIN which is used by all the street teams provides comprehensive annual rough sleeping figures. Figures from CHAIN similarly indicate that rough sleeping is increasing. Yet the statistics also illustrate that the vast majority of people contacted by the outreach teams are only on the street for days or weeks. Increased weekend shifts and prompter, more efficient responses have enabled the outreach teams to reach new arrivals to the street earlier and to help them off more quickly. These are not the street homeless the public recognise - those people literally living on the street, frequently suffering from poor mental health or with drug and alcohol problems. Increased activity has undoubtedly driven up the number of people contacted. Surely the time has come to measure rough sleeping not only in terms of how many people are on the street but, crucially, how long they have been there? Recently I was involved in a street count around Waterloo and the South Bank in Lambeth, south London. We found in total 15 rough sleepers and concluded that with numbers so low there was no earthly reason why rough sleeping in Lambeth shouldn’t be ended for good in 2012. That night I felt I was accompanied by assorted ghosts. 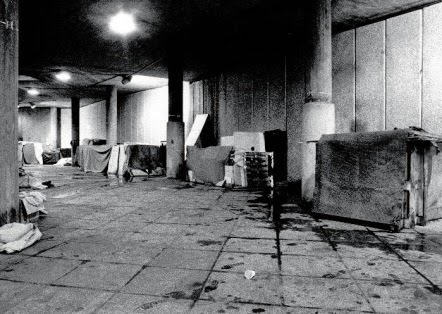 In the late 1980s up to 100 rough sleepers lived in ‘bashes’ (basic shelters constructed from wood and other material) at Waterloo. One of those rough sleepers was another perceptive tweeter @bullringbash who speaks poignantly of the inexorable shadow cast by the bullring over his life. He has escaped homelessness and now lives and works in the Midlands. We communicate about the old days of the bullring, not with wistful nostalgia but with something more akin to revulsion. It was at the bull-ring that I came a across an ambulance crew stooping over the corpse of Archie, a young Scot. His body had lain under a blanket all day and the extensive marks on his torso and legs suggested foul play. But the autopsy showed that he had died of a heart attack and the marks had been left by rats. They had nipped and gnawed his gaunt frame over the preceding twelve hours as he lay there unnoticed and unmissed. We have come so far, yet perversely seem to get satisfaction from denigrating the progress made and the extraordinary efforts of staff at the frontline. Worse, we look back with the selectivity of the chronically amnesic. Ah, my friends, those were the days, where did it all go so wrong?